A Proton rocket carrying a Norwegian communications satellite blasted off from the snow-covered plains of Kazakhstan Monday, delivering its $217 million cargo to orbit more than nine hours later. The 184-foot-tall rocket began the marathon mission at 1134 GMT (6:34 a.m. EST) Monday with a fiery launch from the Baikonur Cosmodrome in Kazakhstan. The Proton's three core stages each fired during the first nine minutes of the flight, followed by separation of the Breeze M upper stage and payload from the launcher's third stage. The Breeze M completed four burns, first to achieve a safe parking orbit about 107 miles above Earth, then to gradually raise its altitude and reduce its orbital inclination to zero degrees. More than nine hours after liftoff, the stage deployed the 4,321-pound Thor 5 communications satellite into a circular geosynchronous orbit. The Proton was shooting for an orbital altitude of 22,864 miles, according to prelaunch data. Officials with International Launch Services, the joint U.S.-Russian firm responsible for marketing the Proton commercially, declared the mission a success Monday evening. The launch was pushed back from Sunday due to technical problems encountered during the countdown. Thor 5 will soon enter service for Telenor Satellite Broadcasting of Norway, a leading communications provider throughout the Scandinavian region. The satellite was built by Orbital Sciences Corp. of Virginia. Based at 0.8 degrees west longitude, the spacecraft will replace the 10-year-old Thor 2 satellite, which is nearing the end of its design life. For up to 15 years, Thor 5 will provide customers with three times more payload power than its predecessor, linking regions including Scandinavia, Eastern Europe and the Middle East. Thor 5's 24 Ku-band transponders, attached to fixed and mobile spot beams, will beam direct-to-home broadcasting and interactive telecommunications services to its customers. "The launch of THOR 5 represents a milestone for Telenor Satellite Broadcasting and demonstrates our commitment to the satellite industry and our firm belief that satellites will continue to play an important role as a distribution platform for TV entertainment," said Cato Halsaa, CEO of Telenor Satellite Broadcasting. Another Thor satellite should be ready to launch next year to add additional communications capacity for Telenor. "Telenor Satellite Broadcasting firmly believes that growth in HDTV and niche TV channels will continue to create an increased demand for satellite capacity and with our satellite replacement and expansion program on track, we are confident that we can deliver a highly competitive distribution platform for our customers," Halsaa said. 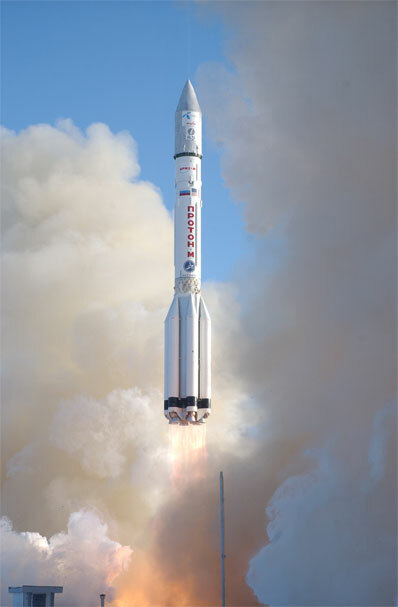 Monday's launch was the second for the Proton this year, and the first for International Launch Services.